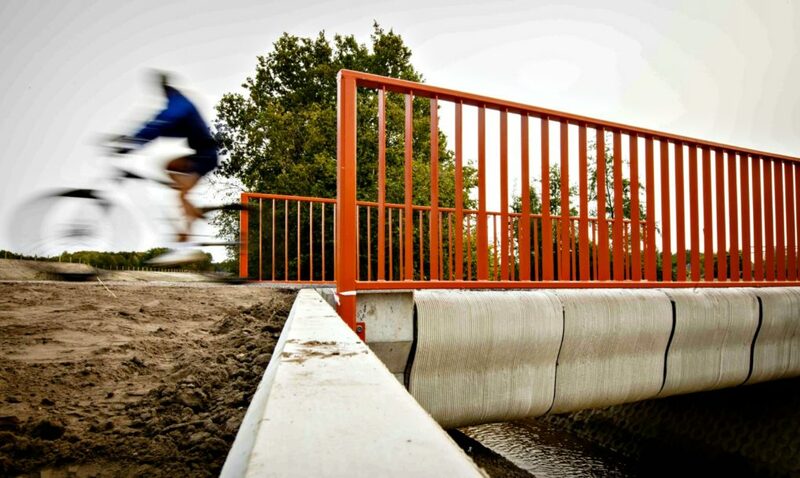 Built with cyclists in mind, the bridge can withstand loads up to two tonnes. As developers continue searching for newer, smarter approaches to addressing cities’ infrastructure issues, 3D printing looks poised to become the next big thing in construction. Reducing labour time, waste, and costs, it has the potential to duly disrupt the industry should it grow to be seen as viable. Proving that the technology is indeed able to be utilised in such a manner, the Eindhoven University of Technology recently unveiled what they are claiming is the world’s first 3D printed bridge. Located near the small Dutch town of Gemert in the Netherlands, work on the innovative bridge began in June 2017. Constructed by BAM Infra Nederland, a Dutch construction company, the bridge is eight metres long and stretches across a water-filled ditch to connect two roads. According to EUT, the bridge is designed to last for approximately 30 years. Though it is primarily meant for the use of cyclists, it can reportedly withstand loads of up to two tonnes. Constructed using pre-pressed concrete, the 3D printing techniques employed in the bridge’s production led to less concrete being used than would be required by more traditional methods. “Fewer scarce resources were needed, and there was significantly less waste,” head of BAM, Marinus Schimmel, explained of the construction process. Made up of around 800 printed layers, each concrete section was reinforced with steel cable. Believed to produce less CO2 emissions than traditional methods of concrete construction – as there is no concrete waste and no forming structures – the ecological and economic aspects of the method are clearly of greater value to our modern world than those of more outdated techniques. Perhaps, in the construction industry of the future, we’ll see 3D printers become more ubiquitous than cement mixers. Watch the Eindhoven University of Technology’s bridge come to life in the video below.